We promote art, professionalism, and individuality. Let us "Amp up your life." 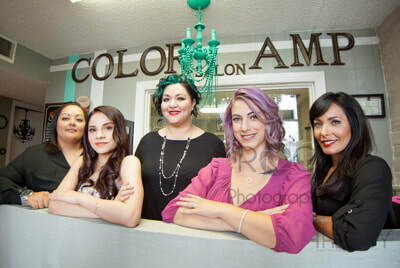 Color Amp Salon was established on March 1, 2011. We are a full service salon and provide a cozy home feeling for everyone that walks through the door. We have a combined experience of over fifteen years and collaborate with a team of skilled, educated, and certified creative professionals. We take pride in our careers and invest time into continuing our education to make sure we always stay on top of the latest techniques and trends. Our goal is to provide excellent customer service to all our valuable guests. We treat our guests with the utmost care and respect, delivering high-end quality services that are fun and tailored for each individual's style. We at Color Amp Salon take pride in our skills, artistry, as well as your hair's integrity. We specialize in offering services in a manner that will always the hair's integrity into consideration. We also offer exclusive, high-end quality products. Within the years, we have had the opportunity to work on celebrity clientele such as Sonique from RuPaul's Drag race, and WWE's Hunico. We have also worked on numerous models, photo shoots with creative photographers, L'Oréal Paris Cosmo campus tour, and a commercial shoot for Sunland Park Racetrack and Casino. We were also published and featured in The City Magazine of El Paso/Las Cruces in 2015. In June of 2018, we took a chance to compete in our very first competition. We competed in the Fatale Femmes Battle of the Salons, El Paso, and placed fourth. We had the pleasure of meeting amazing artists and celebrity judges Robin Slonina (Skin Wars Judge) and Laganja Estranga (RuPauls Drag Race).